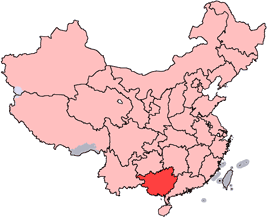 Guangxi (Zhuang: Gvangjsih; Simplified Chinese: 广西; Traditional Chinese: 廣西; pinyin: Guǎngxī; Wade-Giles: Kuang-hsi; Postal map spelling: Kwangsi), full name Guangxi Zhuang Autonomous Region - a Zhuang autonomous region of the People's Republic of China, located on the southern coast of the country. It borders Yunnan to the west, Guizhou to the northwest, Hunan to the northeast, and Guangdong to the east. It is also bordered by Vietnam to the southwest and the Gulf of Tonkin to the south, with Hainan island also lying directly below in the South China Sea. The capital city of Guangxi is Nanning. The region's name, "Guang" literally means "expanse," and has been associated with the region since the creation of Guang Prefecture in 226. "Guangxi" and neighboring Guangdong literally mean "Guang West" and "Guang East," and together, Guangdong and Guangxi are called the "Two Guangs" (两广, Liǎng Guǎng). 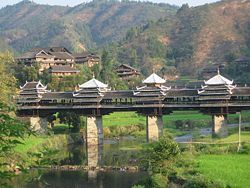 The abbreviation of the region is 桂 (Gui), which comes from Guilin, a major city in the autonomous region. Guangxi has played a critical role in China's history during the past 2,000 years although remote from China's power centers on the Northeast Coast. The provinces' ethnic composition has a higher percentage of non-Han Chinese than most Chinese provinces, leading the People's Republic of China to declare Guangxi as the "Guangxi Zhuang Autonomous Region." With 14 million people out of Guangxi's total of 48 million population having Zhuang ethic roots, the province has a distinctly multi ethnic composition. As with other southern provinces bordering neighboring nations, Zhuang has a frontier sense of independence and freedom. The region officially became part of China in 214 B.C.E., when the army of the Qin Dynasty claimed most of southern China. The name "Guangxi" can be traced to the Song Dynasty, which administered the area as a circuit called the Guangnanxi Circuit (literally meaning "Guang-South West Circuit"). During the late Mongol Yuan Dynasty, the name was revived again for a province that was created in the region, but it was shortened to "Guangxi," or "Guang-West." For the next six centuries after that, Guangxi remained a province of China until its conversion into an autonomous region by the People's Republic of China due to its large Zhaung population. During the late Qing Dynasty, Guangxi was the site of the Jintian Uprising (金田起义) which occurred in what is now Guiping county in eastern Guangxi on January 11, 1851. On March 23, 1885, Zhennan Pass (now Youyi Pass) on the border with Vietnam was also the site of the Battle of Zhennan Pass (镇南关战役) during the Franco-Chinese War. During this battle, a French incursion was routed by Chinese forces under Feng Zicai (冯子才), which is an event that has been exalted by subsequent Chinese nationalists ever since. After the founding of the Republic of China, Guangxi served as the base for one of the most powerful warlord cliques of China: the Old Guangxi Clique. Led by Lu Jung-t'ing (陆荣廷) and others, the clique was able to take control of neighboring Hunan and Guangdong provinces, and control them until it fell in the early 1920s. It was eventually replaced by the New Guangxi Clique, led by Li Zongren and Bai Chongxi. Guangxi is also noted for the Baise Uprising (百色起义), a communist uprising led by Deng Xiaoping in 1929. During this movement, many Communist bases were set up in the province, but they were eventually destroyed by Kuomintang forces during the Chinese civil war in the 1940s. In 1944, near the end of World War II, Japan invaded Guangxi as part of Operation Ichigo (also known as the Henan-Hunan-Guangxi Campaign) in an attempt to seize the Hunan-Guangxi railway line and open a land link to French Indochina. The operation was successful, and as a result, most major cities in Guangxi came under Japanese occupation. This occupation ended in 1945, when the Japanese were defeated, but it signaled the beginning of the Chinese civil war that lasted until 1949. During this time, the region was controlled by the Kuomintang under the Republic of China. 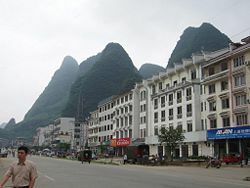 As part of southern China, Guangxi was not freed by communist forces until after the People's Republic was established. It officially joined the PRC in December 1949, two months after the Republic's foundation. In 1958, Guangxi was converted into an autonomous region for the Zhuang people by recommendation of Premier Zhou Enlai. This decision was made because the Zhuang were one of the biggest minority groups in China, and were mostly concentrated in Guangxi. However, they also form a minority of neighboring Guangdong's population. For most of its history, Guangxi has been landlocked. However, in 1952, a small section of Guangdong's coastline was given to Guangxi, giving it access to the sea. This decision was subsequently reversed in 1955, but restored once more in 1965. While minor development of its heavy industry sector occurred during the 1960s and 1970s, the region has remained largely a tourist destination, utilizing its beautiful scenery to create a strong tourism industry that is visited by people throughout the world. Although China has experienced substantial economic growth since the 1990s, for the most part, Guangxi has been left behind, not benefiting nearly as much from the growth as some of the other areas in southern China such as Guangdong and Shenzhen. However, in recent years, there has been a growing movement towards industrialization, and increased concentration on cash crops in the province. As a result, per capita GDP has begun rising more rapidly, and industries in Guangdong seeking a way to locate production to lower wage areas have moved many of their operations into Guangxi, leading to even more economic expansion. 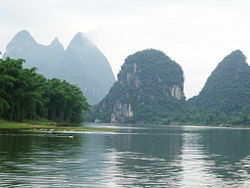 Guangxi is a mountainous region. The Nanling Mountains run along its northeast border, with the Yuecheng Mountains (越城岭) and Haiyang Mountains (海洋山) extending outward as shorter branching ridges. Nearer to the center of the region are the Dayao Mountains (大瑶山) and the Daming Mountains (大明山). To the north there are the Duyao Mountains (都阳山) and the Fenghuang Mountains (凤凰山), and the Yunkai Mountains (云开大山) run along the province's southern border. The highest point in Guangxi is Mount Mao'er (猫儿山) located in the Yuecheng Mountains, at 2141 m.
Guangxi is rich in water resources, with an estimated 188 billion cubic meters of surface water flowing throughout its land territory. That total accounts for 7.12 percent of the nation's total and ranks fifth among all of the provinces in China. The three largest water systems running through Guangxi are the Zhujiang, Yangtze and Duliu rivers, but many other small rivers cut valleys through the various mountains of the region. Most of these rivers stem from the tributary basin of the West River. In addition to its rivers, Guangxi has a short coastline along the Gulf of Tonkin, providing it with an ideal location for ports. Guangxi has a subtropical climate. Summers are generally long and hot. Average annual temperature is 17 to 23°C, while average annual precipitation is 1250 to 1750 mm, growing gradually southward from the north. The rainfall from the time between April and September makes up about 75 percent of the total annual rainfall in the region. The 14 prefecture-level divisions of Guangxi are subdivided into 109 county-level divisions (34 districts, 7 county-level cities, 56 counties, and 12 ethnic autonomous counties). Those are in turn divided into 1232 township-level divisions (699 towns, 369 townships, 58 ethnic townships, and 106 subdistricts). Agriculture plays a vital role in Guangxi's economy. Some of its important staple crops include rice, maize, sweet potatoes, and wheat, while its cash crops include peanuts, tobacco, kenaf, and sugar cane, for which Guangxi is China's largest producer. Along with these various crops, Guangxi is the country's largest producer of fruits. Some of the most widely grown fruits in the province include pomelos, tangerines, mandarin oranges, lemons, lychees, pears, papayas, bananas, and water chestnuts. Guangxi has more tin, manganese, and indium deposits than any other province of China. As a result of this strong resource base, the region has emerged as a major nonferrous metal production base. The region also has the largest reserve of lime and is rich in timber and forestry reserves. Heavy industry has developed quickly in Guangxi, thanks to the economic reforms of Deng Xiaoping that were enacted during the 1970s. Some of the region's largest industries include the iron works and steel works in Liuzhou, machinery production in Nanning and Wuzhou, and the cement works of Liuzhou. Along with these industries, Guangxi is estimated to have enormous energy potential, with a power generating ability coming to 78.8 billion kw/h annually thanks to its abundant water resources. Statistics from 1999 showed that existing hydropower stations in Guangxi had a total installed capacity of 6.1 million kw, with the annually generated electricity being 24.73 billion kw/h. However, there is still a large amount of room for development of this industry, and it should play a major role in Guangxi's economy as the national economy continues to grow and the demand for energy resources increases. Despite these positive attributes, in recent years Guangxi's economy has languished behind that of its wealthy neighbor and twin, the province of Guangdong. Guangxi's 2006 nominal GDP was about 480.2 billion yuan (US $62.1 billion), which ranked sixteenth in China. Its per capita GDP was 10,240 yuan (US $1,330). The region's demographic breakdown is similar to other provinces of China in that Han Chinese make up the largest percentage of the population. However, Guangxi differs in that it has a high concentration of Zhuang people, numbering over 14 million, which makes them one of the largest ethnic minorities in all of China. Over 90 percent of the Zhuang in China live in Guangxi, and they are especially numerous in the central and western regions. In addition to the Zhuang, there are also a significant number of both Dong and Miao minority peoples. Other ethnic groups include: the Yao, Hui, Yi, Shui, and Gin (Vietnamese). According to statistics from the end of 2000, there were 30 institutions of higher learning with an enrollment of more than 117,900 students and a faculty of 9,300 in Guangxi. In addition, there were 6,484 secondary schools with 6,038,000 students and 272,200 teachers and 16,109 primary schools with 5,368,000 pupils and 199,000 teachers. In 2000, the enrollment rate of school-age children was 98.68 percent, while the illiteracy rate was 3.79 percent. The decades following the founding of the People's Republic of China, especially after 1960, have witnessed a rapid increase in the education levels among the entire population of Guangxi. However, the education system is still relatively weak compared to the rest of the country, which can be observed from the province's low proportion of people with a higher education and its low overall educational rate. Guangxi is known for its linguistic diversity. In the capital of Nanning, for example, four dialect-languages are spoken locally: Southwestern Mandarin, Cantonese, Pinghua, and Zhuang. The region is also well known for its traditional arts and craft work. Among the numerous handicraft products produced in Guangxi, some of the most significant ones include the native cotton cloth of Yulin, the ramie cloth of Guilin, the bamboo paper and rice paper of Chaoping and Guilin, and the bamboo combs of Guilin. The city of Pinyang also produces other popular articles, including ceramics, fans, felt caps, copperware, combs, brushes and straw bonnets. The major tourist attraction of Guangxi is Guilin, a town famed across China and the world for its spectacular setting along the Lijiang River, and amongst several karst peaks. It is a former capital of Guangxi, that houses the Jingjiang Princes City, which is an old princes' residence that is open to the public. South of Guilin down the river is the town of Yangshuo, which has become a favorite destination for foreign tourists, particularly backpackers. Ethnic minorities native to Guangxi, such as the Zhuang and Dong people, are also interesting for tourists, because of their unique culture and history. The northern part of the province, bordering Guizhou, is also home to a prominent tourist sight, the Longshen rice terraces, which are said to be some of the steepest in the world. Guangxi. West China. Beijing, China: China Intercontinental Press, 2001. ISBN 9787801138125. Marks, Robert. Tigers, Rice, Silk, and Silt Environment and Economy in Late Imperial South China. Studies in environment and history. Cambridge [England]: Cambridge University Press, 1997. ISBN 9780521591775. Shin, Leo Kwok-yueh. The Making of the Chinese State Ethnicity and Expansion on the Ming Borderlands. Cambridge [England]: Cambridge University Press, 2006. ISBN 9780521853545. This page was last modified on 18 July 2017, at 15:00.